The original jingles have been linked in the review against their mentions, and you can watch videos created for the album at the end of the review. The retro sound in I Don’t Know Where I’m Going (that originally appeared in this Titan ad featuring Katrina Kaif) is instantly recognizable with Mikey McCleary’s style from his past classic reinvention albums. Except in this case there is no Indian song element, rather Mikey going full throttle rock and pulling it off in style, even taking care of the vocals himself. That organ solo by Ramon Ibrahim in the second half is awesome! The song has a trippy POV video too. The Vodafone facebook jingle gets an extension in Open Book, a lovely melange of keys and strings. And Mauli Dave is brilliant with her singing. The inspirational piece that Mikey composed for Levi’s Curve ID retains the original vocalist Anushka Manchanda in the extended version called Chase Every Dream. The sound is very characteristic of the theme, and hence comes with the familiarity which doesn’t work much in favour of the song. Nevertheless, there is a star-studded video that’s been made for this song. Shalmali Kholgade rules the zingy retro pop track that is Just A Little Crush (made originally for the Lakme Fruit Blast ad featuring the gorgeous Lisa Haydon) with a rendition peppered with a lot of her trademark touches, even as Mikey produces a delightfully rich arrangement in the backdrop. Shalmali’s second song You Got Me too has her playing the girl-in-love act to perfection, once again to a buoyant orchestration from the composer that features some lovely guitars and brass (the original Titan ad). The longest track of the album, If I Go Mad, is from Aamir Khan’s 2011 Titan HTSE commercial, and has the composer back behind the mic. Mikey builds well over the Beatles-ish base here with some nifty techno enhancements. For the electro rock piece If You Feel (jingle of Audi A6 India campaign), Mikey gets a singer frequently associated with the genre, Monica Dogra. And the lady aces the song, sounding dreamy as she does amidst such heady arrangement. I Feel Wonderful is the only track that actually undergoes a marked difference from its jingle version. The long instrumental prelude in the ad is taken off (or does it become the background track?) for Mikey’s vocals. Very soothing composition, the bossa nova flavour and the wonderful choice of instruments, accordion and mandolin in particular. If I were to pick two favorites from the album (though I love all), it would be the remaining two tracks, both of which were originally composed for Vodafone (1 and 2). World Is Our Playground keeps flitting between Take Five and waltz modes in an addictively seamless fashion, and there are other happy inclusions like the sax from Rhys Sebastian D’Souza. And then there is the very evidently Pachelbel’s Canon-infused The Little Things You Do that takes you to a sunny summer afternoon (which is what the video they made does too). The rhythm is once again waltz-style, and the singing by Anushka Manchanda is irresistible. The classic song reinvention idea was getting increasingly repetitive of late. 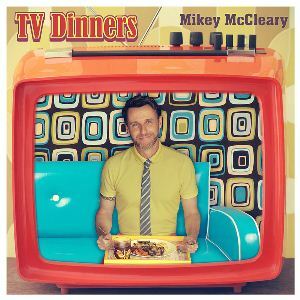 So Mikey McCleary found a new idea of extending his TV jingles and the result is an absolutely must listen album called TV Dinners! Really hope this trend catches on, there are many more jingles I have wanted to hear as full songs. Top Recos: All of them!